The DuraSquare collection features an upgrade of Vero Air. 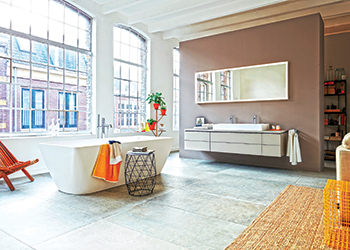 Duravit’s latest collections perfectly coordinate design, function and high comfort, while highlighting trends towards the holistic bathroom of the future. The collections including Luv, Vero Air and Shower + Bath have a consistent design language that can be combined with products from all of Duravit’s series to optimum effect. Precise geometric forms, selected materials and soft, matt colours and textures take their place in the bathroom, while providing scope for individual bathroom furnishings. “Duravit has reinterpreted the basic idea of the holistic interior with the new designs,” says a spokesman for the designer bathroom manufacturer. The Nordic furnishing style portrayed in the Luv bathroom series is characterised by clear forms and soft, natural colours. Designed by Danish designer Cecilie Manz, Luv combines Nordic design with new technologies, colours and new materials. The Luv series offers new design possibilities for larger rooms and guest bathrooms. The above-counter basins made from DuraCeram impress with their subtle lines, generous inner basin and clear edges. Duravit has, for the first time, used matt glazes in soft tones on the outside of the bowls, which contrast with the high-glaze white ceramic inside the bowl. The distinctively shaped baths are made from DuraSolid A mineral material, which offers a pleasantly warm feel and a high-quality matt look. The Vero Air design by Duravit is in keeping with the trend towards clear and timeless furnishings. The entire bathroom series impresses both purists and individuals with a feel for durable design, featuring a clear, classically rectangular form. The range’s washbasins and bathtubs impress with reduced edges and a striking linear charm. In the new DuraSquare collection, Duravit presents an upgrade of Vero Air that sets new standards with its clarity, precision and reduction. Exact edges blend with the organically flowing inner contours. From the washbasin to the bathtub, the collection is designed to be sustainable and is made with the innovative materials DuraCeram and DuraSolid. Combined with the new furniture frame, the washbasins become a veritable eye-catcher in the bathroom. Its flexible base is height-adjustable and can be supplied in silver (chrome) or matt black. Meanwhile, where space is at a premium, Duravit has succeeded in combined contemporary bathroom design and optimum use of space with its innovative Shower + Bath combination. The design by Eoos features a walk-in shower and bathtub in one. The functional versatility of Shower + Bath is a result of the high level of precision in the finishing and the use of the innovative material DuraSolid A. Among other innovations, the new console system comprises uniform furniture consoles in two different thicknesses (30 and 45 mm) and with a variable width and depth. They can be combined with vanity units and furniture from a total of seven Duravit ranges: L-Cube, Vero, Happy D.2, Delos, DuraStyle, Ketho and X-Large. The consoles are available with 32 different finishes from high-gloss lacquer, for example in Apricot Pearl or Stone Blue, to real wood fronts such as oak or walnut. With individual combinations such as a walnut console and discreet, white vanity units, interesting accents can be created. Founded in 1817 in Hornberg in the Black Forest, Duravit today operates in more than 130 countries and works with high-profile international designers, such as Philippe Starck and Eoos.